It’s hard to find a good free to play strategy game. So many titles were built on an aging pay-to-win formula that turns away all but the most dedicated and the most casual players. 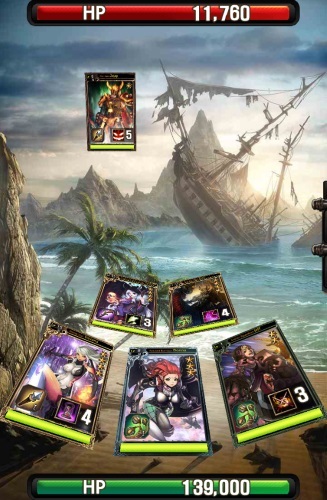 It’s left some of us skeptical that strategy games can really succeed in a F2P model. 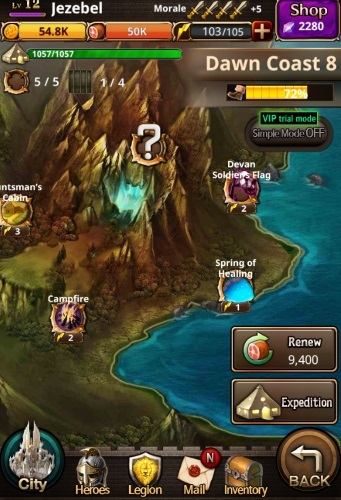 While the surge of browser-based strategy MMOs has faded, the genre is finding new life on the open and accessible world of mobile gaming. It’s there, among the endless array of apps, that you’ll find Toast’s (NHN) Battle for the Throne. 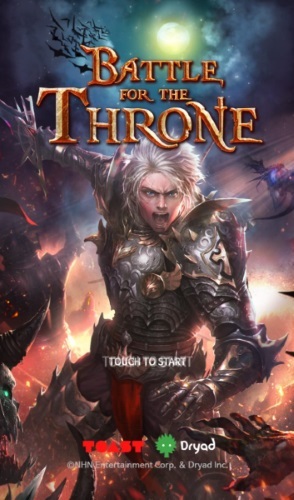 Battle for the Throne takes fairly common strategy MMO elements and contorts them into new forms. MMORTS players will find some similar themes and features that are no longer in the cookie-cutter mold, although the end result is distinctly similar. 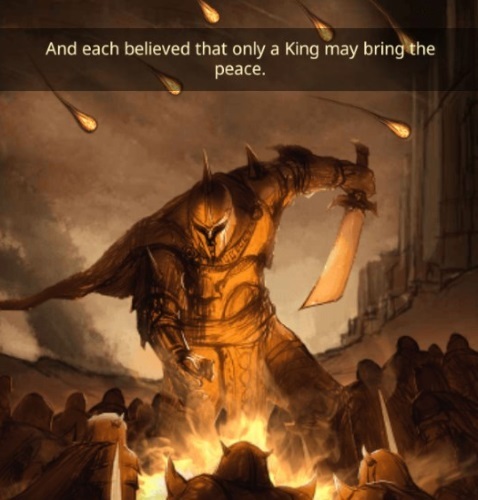 In short, Battle for the Throne is not ground-breaking. It is, however, a new take on how classic strategy mechanics are implemented, making it a more interesting game to play. You play as the Lord of a kingdom facing the evil Devan Empire, who seeks to conquer and crush all the land under its banner. It is your duty to manage your kingdom and an army of heroes, and you will spend your time split between developing your city and exploring nearby lands to claim them for your own. As a story-based game, the game is focused more on a single-player experience, and thus does not have a persistent multiplayer map. Your city serves as a base hub for gaining resources, gathering troops, building defenses, research, special missions, and training and recruiting heroes. Like other strategy games, most of these tasks use a time-based system to get the work done. You won’t spend much of your time here, but the time you do spend here is important, even if many of the features are glossed over by the game’s awkward tutorial missions. Battle for the Throne simplifies resources for players into two categories: food and gold. 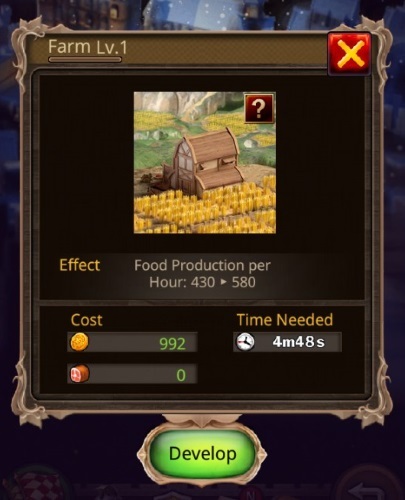 You have five different production areas under “Facility.” Farm, Ranch, and Fishery produce food, while Market and Mine produce gold. These resources can also be found and earned through quests and exploring. 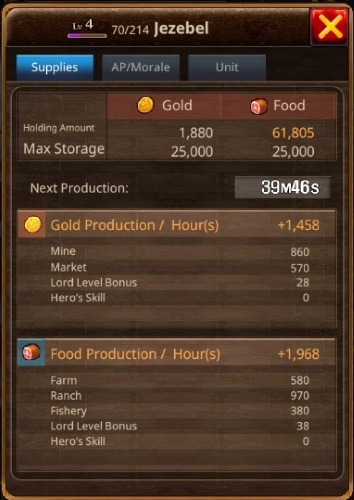 Both of these resources are used for various city developments, though food is more commonly found than gold. You are also limited in how much of these resources you can store, and that capacity is upgradeable in the Storage area. After resources, your troops and city defenses are second priority. Troops may be recruited at the Barracks with food in different amounts, and are lost as your units are hurt in battle. Units have also been simplified to a single type, so there’s no fuss over hiring archers or cavalry over foot soldiers – those specifics are determined by your Heroes. The Fort allows you to build both your city walls and a trap to spring on your enemy when they attack. Both of these are essential, as all players (after an introductory grace period) are PvP enabled and may be attacked at any time. The Laboratory allows you to research in two areas: Battle and Production. 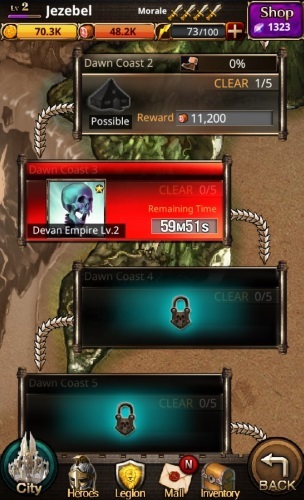 Battle research offers permanent passive buffs to your units in battle, while Production offers permanent passive bonuses that are more civil in nature. Each has multiple areas of research, and each level offers minor bonuses at high costs; however, these buffs do add up and are necessary to compete with serious players. Meanwhile, the Council offers a few special missions that you may send heroes on; these do not require your personal attention and offer substantial rewards for completion. Heroes are the backbone of your gameplay in Battle for the Throne, and play a significant role in both City and Explore tasks. Here the game takes inspiration from mobile card games. Each hero is represented by a “card,” which have rarities of one to five stars. 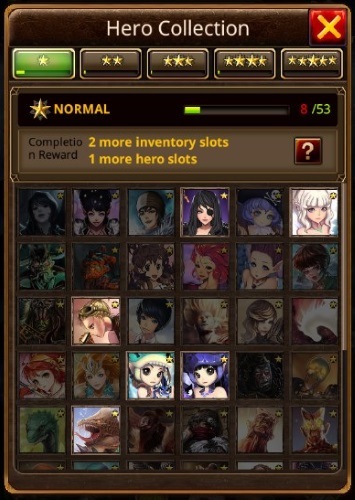 Heroes can be recruited via the Tavern, found in rare Hero Box rewards, encountered at mercenary camps in Explore, or purchased (randomly) from the cash shop. The rarest and best cards are mostly found in the latter, and with open PvP, it places a real emphasis on “pay to win” in the later stages of the game. Players who aren’t concerned with PvP, however, will do fine with whomever they are able to recruit. One particular recruiting nuance is worth mentioning here: the Visiting Force. These are special factions that offer a select set of rare, recruitable heroes, but with three special conditions. 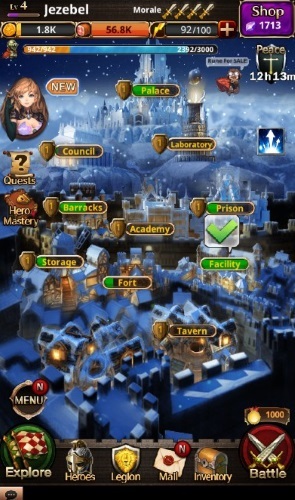 The first condition is that the faction is currently visiting the city; for instance, Da Vinci and Thieves Guild factions only visit temporarily after discovering them in Explore. The second condition is your rating with the faction. A higher rating grants you a chance for better heroes, but gaining that rating requires spending heavy amounts of precious gold. You also gain a small amount of reputation each time you encounter them in Explore, but it is not enough to rely on. Finally, heroes may only be recruited by using special faction-specific vouchers, found rarely, so it’s best to hoard these in the early game while you take the time to build your reputation. Each hero has three core stats: POW (Power), INT (Intelligence), and LEAD (Leadership). 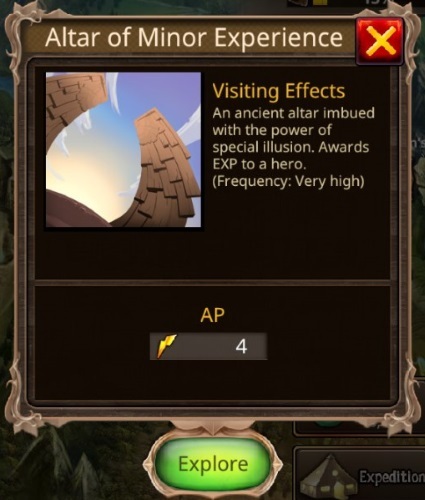 All three of these stats become important in different areas of the game. Heroes with heavy POW excel in dueling and battle. Heroes with high INT excel in city development and hero recruitment, while those with high LEAD can command more units (determining their Attack and Health). Since heroes must be assigned to development and persuasive tasks in the city, which then prevents them from going on explore missions, you are left with two choices. The first is to alternate your time and effort between the two areas – sending your best heroes out to the field to explore until your energy is low, and then returning to idly let your heroes work on city development during downtime. However, advanced players recommend having two sets of heroes, one for battling and exploring and ones for city development. As you are limited on how many total heroes you can own, this tactic requires keeping and leveling ten good heroes – an expensive prospect, to say the least. While heroes do not gain experience from combat directly, they do progress and grow stronger. 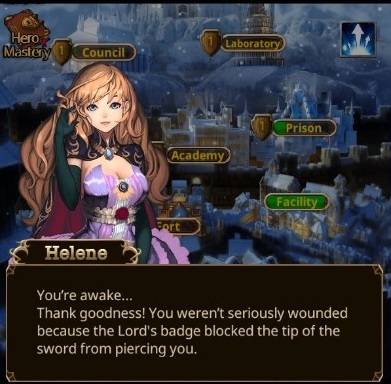 Experience can be gained from certain events in Explore, or by merging unwanted heroes as experience fodder onto them at the Academy. Additionally, if you happen to draw a mercenary you already own when recruiting, a Limit Break will automatically occur, merging the two cards and giving the hero experience and boosting their maximum level. The downside to this, of course, is that you can’t have multiples of the same awesome hero to do your dirty work. Heroes can also learn and boost skills based on their class. 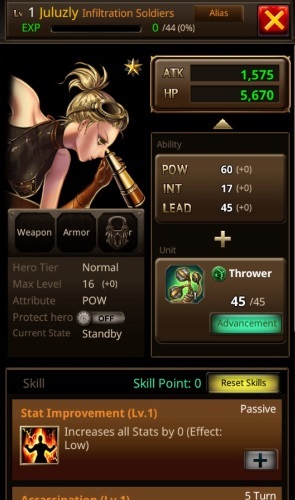 You can also equip your heroes to boost their stats, but be warned that once assigned to a hero, a weapon cannot be removed and given to another (unless, of course, you fork out the cash). Like heroes, equipment can be upgraded through a fusion system. So far, the features I’ve discussed in Battle for the Throne are pretty formulaic. Exploring, however, is a particularly strange feature. It’s here that you will spend most of your game time early on, and where you will gain most of your resources, items, experience, and heroes. At the top most level, Explore consists of a segmented map with multiple areas to unlock as you progress. Each area is then segmented further into smaller stages, which may be completed a limited number of times for additional rewards. Upon entering a stage, you’ll be presented with a small chunk of the map, and several scattered events that show their name and energy cost. In the upper right, you’ll also have a progress bar that represents colonization of the area. The goal in these stages is to repeatedly explore the area by activating events until your progress bar reaches 100%. When a set of events is cleared from the map, you may “Renew” the area for free to get a new set, or you may renew the area manually at the cost of food. When you reach 100% colonization, you will be prompted to battle the boss. Succeed, and gain an extra reward. This system is certainly novel for a strategy game and works well on the mobile format. Unfortunately, it’s also about as fun as licking envelopes. Exploring is nothing more than idle tapping to clear events off the screen in order to watch that yellow bar fill up. And as I’m about to explain, the battle system adds nothing to this droll diversion. So it’s time for battle. You’ve picked your best warriors to come with you, and now you’re ready to face off against an elite Devan solider. Only it turns out, your heroes don’t really need you to do much at all. When first entering a battle, you’ll be prompted to select offensive tactics. This gives you the chance to use cash-shop purchased bonuses, such as Siege, which doubles your chance of catching prisoners. After making that decision (if you have one to make), you’ll move on to choose your hero deployment, or party formation. Battle for the Throne uses a rock-paper-scissor type system, where each hero type (represented by a small icon on their avatar) has a certain strength and weakness against other types. 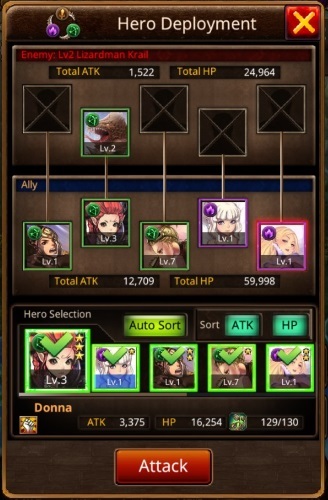 Thanks to an automatic sorting system, though, you don’t need to really worry about rearranging your heroes manually either (except against particularly difficult fights). Finally, you’re into the battle itself, but don’t get too excited: battling is completely automatic. Your cards and your enemy’s cards will face off against each other, use skills automatically, and battle until one force is eliminated. 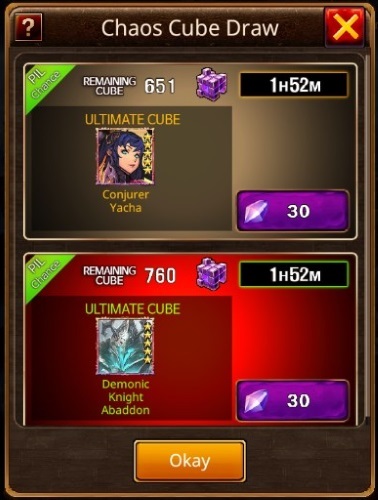 If you buy into the game’s VIP system (essentially optional subscription bonuses) you can fast forward or skip through this combat, but does it really matter? This kind of combat is no better than the increasingly common browser-based MMOs that will automate everything from quests to combat for you, only needing your input to confirm each action while you watch the AI do the part of the game that should be fun. Battle for the Throne proves a difficult strategy game to judge. On one hand, it tries to do things differently than its competitors, and some of those efforts (such as city development) are successful. On the other hand, the game’s pay to win advantage is ugly and the majority of the gameplay is monotonous. For the sake of brevity, I haven’t touched on a few additional details and features Battle for the Throne has to offer, such as legions, raids, friends, and PvP. However, I’m confident enough to say that these systems do offer rewards of their own, encourage multi-player action, and add a little more excitement to day-to-day gameplay. And, despite the nibbling on player’s pockets, the game is also generous with gifts of heroes, energy replenishment, and other tokens to make even free players succeed. Still, Battle for the Throne also suffers from the fact it takes away too much power from the player. Energy limits, hero limits, click-to-progress exploring, and automated battles strip players of meaningful ways to engage with the game, especially in a strategy game where planning and waiting are only meant to be half the equation. Battle for the Throne is certainly above average for mobile strategy games, and is worth the free download for strategy fans looking for something new but not necessarily exciting. If you hate having your game progress handed to you, though, look elsewhere.